The Sporran, the only pocket your kilt has. The word sporran is derived from the Gaelic word for purse. And as the name suggests that's exactly what it is. As the traditional kilt doesn't have any pockets, it's a very important accessory to the kilt. Some believe (and its quite feasible) that it derived from the medieval belt-pouch. But of course it is not only functional, but also decorative (in the case of the dress sporran, often highly decorative) and as a very important part of the Highland Dress, it should be given due consideration before deciding which one is right for your kilt. The functional aspect is clear, you need somewhere to keep your wallet(pocketbook), mobile phone etc. But it is the decorative aspect that I find more appealing. Basically there are three different varieties, one for day wear, one for semi dress and one for formal wear. The day wear one is usually a simple brown or black leather purse with little adornment, often with three leather tassels and Celtic knots embossed into the leather. And it could certainly be argued that it is more practical than decorative. The semi dress version is naturally more decorative, with a lot more tooling of the leather and often chrome work incorporated into the design. The dress version on the other hand is highly decorative, and is normally a little larger than the other two. It is usually made from animal skin (I would like to point out that it is not made from endangered species) and has more often than not a chrome, or in the case of a really expensive one a silver cantle. The cantle can be decorated with many different Celtic designs, and it trims the top. The face is made of animal skin as are the tassels. Below is a photo of my dress version, which I trust will give you an idea of how they look. There is actually a forth one which deserves a mention, although not one that you yourself would wear unless you are in a military pipe band. The military versions are often flamboyant, designed to give the piper's outfit that extra sense of style. They are normally made with long horse hair, that swishes from side to side as the piper marches. And if you have ever seen a pipe band marching, as I'm sure you have, you will know what a wonderful spectacle it is. 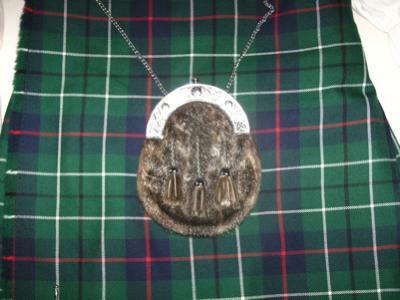 The sporran is worn on a chain, hanging a bit below the belt buckle. The buckle is often decorated to match the design on the cantle, and also the Sgian Dubh. During a wedding reception or dinner dance, or any other occasion where dancing takes place, it is normal to slide it over onto your hip, therefor allowing you to dance closer to your partner without it getting in the way. As always I hope I have answered all your questions on this particular aspect of Highland Dress, but if not then please feel free to contact me using the "Contact Us" page on the navigation bar, I look forward to hearing from you.